The house was built by the previous owners in 1962. Last big event was a couple of weeks prior to this investigation. One of the homeowners came home and drove down the driveway and saw someone looking through the curtains of the East living room upstairs. The other homeowner was in the basement. One of the homeowners seeing a misty grey apparition of legs in the basement was fairly recent as well. Orbs have been seen in the basement as well as out the back door of the basement. 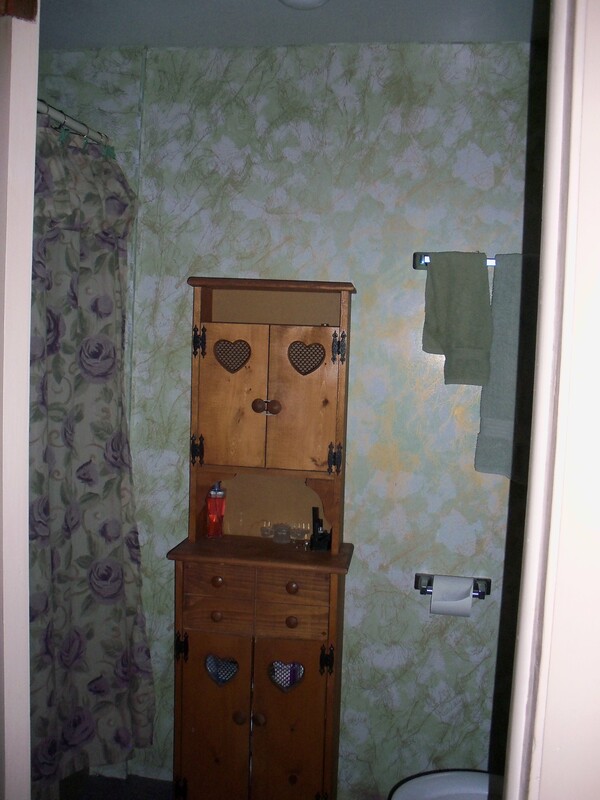 One of the homeowners has witnessed seeing the bottom half of a misty, grey apparition walking from the computer area in the corner to the steps to go upstairs. One of the homeowners has seen shadows out of the corner of his eye (while sitting on the couch) traveling along the top of walls close to the ceilings. This is where most guests feel uncomfortable. One of the homeowners has heard a little girl laughing and playing in the hallway. One of the homeowners claims someone ran up behind her in the hallway and then no one was there. One of the homeowner's guests has seen a man walking down the hall with a green top hat, green pants, green vest and a jacket and no face. The man looked at the visitor, stopped and turned and walked on down the hallway. The visitor went outside and the garage door opened and shut. There was no one there. The door to the basement slammed shut in the middle of the night. This is during a time that the top right corner of the door would stick and you couldn’t shut it. Many, many things happen to both of them in this room, mainly around 3am or after. They’ve heard sounds, they’ve seen and smelled things. Many of the stories involve the closet in the room. They’ve heard sounds coming from the closet and people have claimed to be pushed when they’re standing in front it. Because it makes one of the homeowners uncomfortable, the closet doors are always closed. One night they experienced power outages off and on (along with the neighborhood) and One of the homeowners noticed the door to the bedroom open and shut followed by a shadow crawling across the upper part of the walls. In another experience they had electrical outages in different parts of the house (and not the rest of the neighborhood) off and on. The electric company called them to ask if they were experiencing electrical problems. They feel this was paranormal. One of the homeowners has also woken up to 3 caped people staring at him at the end of the bed and walked through the door. In another experience there was a young man sitting on top of the dresser just watching them. He was there for about 20 minutes and then was gone. One of the homeowners has seen the silhouette of a smaller framed woman out on the front stoop from the bedroom windows. There were no prints in the snow. Nothing has happened in the bathroom connected to the master bedroom. One of the homeowners has woken up to hearing a voice calling “sissy… sissy” from out in the hallway. I (Patrick) do believe I experienced a cold spot as we were investigating the closet and checking things out a week or so before the investigation. It was a pretty big temperature drop all of a sudden and I felt it mostly in my left arm and hand where I was holding the digital recorder. The room got cooler and seemed to spill out into the hallway. The A/C was turned off. They claim the room typically stays hot, especially in the middle of the night while they’re sleeping. There is a large vent outside the master bedroom in the hallway. It is apparently just a cold air return. One of the homeowners was sitting on the couch watching TV one day while the other homeowner was in a back bedroom vacuuming. Out of the corner of his eye he noticed a blonde woman in a red shirt peaking around the doorway from the hall and looking at him. It wasn’t the other homeowner. The blonde woman disappeared when he made eye contact. One of the homeowners had Christmas houses that had lights in them on the mantle. They feel like they had communication using the light in one of the houses with the light going on and off. One of the homeowners used to have a bible open and displayed on the fireplace. She said one time she heard the crinkling of the pages and saw the pages turning. A guest of the homeowners fell asleep one night with the TV on and the remote control resting on his chest. He woke up to find the remote control sitting on the fireplace and the channel was changed on the TV from what he was watching. The dog was whining in the back of his pet taxi shaking. The dog’s door was open and there was a smell of cigarette smoke. The back door to the house was open but the screen door was locked. They found cigarette ashes in the bathroom. One of the homeowners says many times the outside doors will very often be opened but the screen doors are locked. Apparently some people claim to have felt uncomfortable in this room. A few things have happened but nothing major. This is ideal for command central because it is an addition on a raised slab and there isn’t anything below. The kitchen is rarely used as they mostly hang out and prepare food in the basement. Two toy cars were sitting on the kitchen counter. They were remote controlled and they weren’t turned on but they took off across the counter. Other visitors were present and witnessed this. One of the homeowners claims that the pantry door next to the kitchen will unlatch and open after she has shut it. In between the kitchen and the East dining room/living room one of the homeowners has heard whispering and voices. She went outside and she heard a banging on the window from inside the house. No one else was home that day. One day one of the homeowners noticed the characters of her nativity scene in the dining room were turned upside down. The large windows overlooking the driveway is where she saw someone peaking through the curtains at her when she came home one day and the other homeowner was in the basement. One of the homeowners has had these types of psychic phenomena and haunting experiences his whole life from the time he was 4. The other homeowner has had very few paranormal experiences until meeting the other. They’ve had battery drainage in cameras in the home. One of the homeowners says one time his shirt was being tugged like someone was following him holding onto his shirt. They came home one day to find the downstairs door open and the storm door locked. They looked around and a pair of one of the homeowner’s underwear was folded nice and neat on the kitchen counter top. They keep all of their clothes downstairs. Just about every door in the house has been involved in some kind of paranormal activity. During setup in command central we always try to have an audio recorder up and running. Below is a possible EVP from command central while setting up equipment. To my knowledge, the only people in the room were myself and Linda. Norman enters the room shortly after. The first whisper as of now is unidentified and it is unclear what is said and who or what said it. The second whisper is Linda and she appears to be saying “We don’t need all of them”. 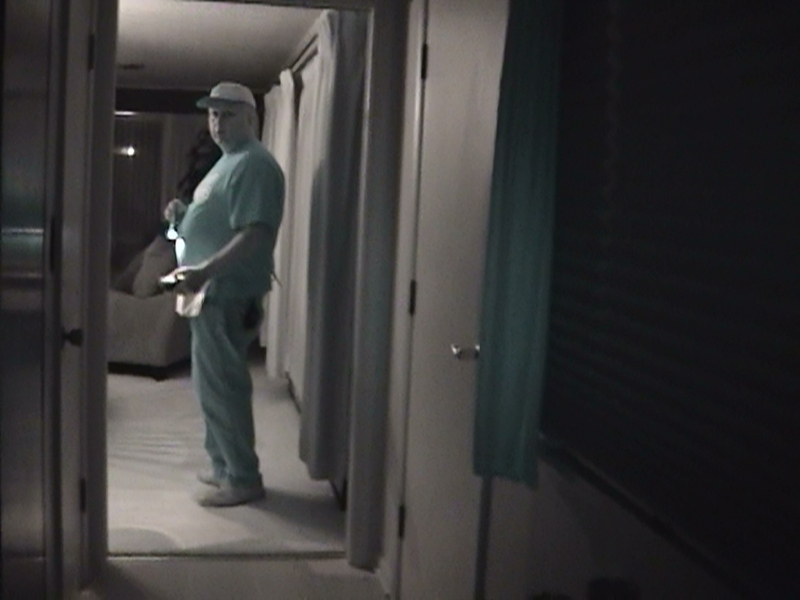 While taking pre-investigation base readings Cassie claims she was poked in the back and saw a white cloud-like figure in the basement bathroom. We have no audio or video from that personal experience. Norman noted the squeaky floor in the hallway. At 9:29pm Cassie’s camcorder completely shut off on its own. The power switch was still in the “on” position. After turning it off and then on again she had power and resumed. There were no strange EMF or temperature spikes and nothing unusual is noticed in any audio or DVR video at that spot. Video Evidence: 10-22-11-2CAM-WEB – Camcorder video from that moment. Approximately 5 minutes later Cassie’s camcorder shut off on its own again. Again, the power switch was still in the “on” position. Norman got a .1mG reading right next to Cassie. Battery read 99% after turning it back on. This was the last time the camcorder shut off on its own. Nothing before the 2 camera shutoffs was recorded. And again, nothing unusual was found in any audio or DVR video at that time. Shortly after the 2nd camera shut off Bailey reported getting goose bumps on her right leg. Norman made note of shadow play on the walls coming from the master bedroom when a car drove down the highway. At 9:45pm you can hear a thump coming from somewhere. 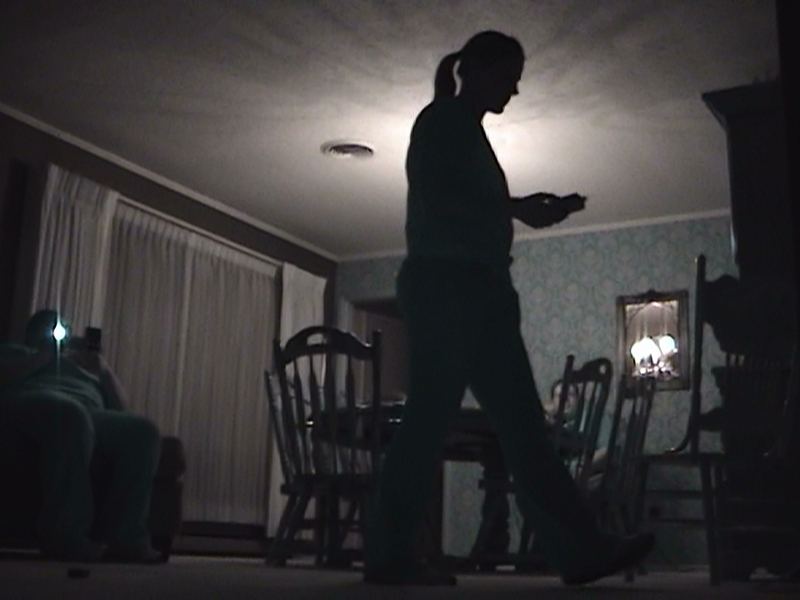 Cassie mentions it and thinks it came from the hallway… no one else claimed to have heard or made the noise. At one point we heard the bass from a car as it drove by somewhere close to the house. Norman mentioned that at the most, his EMF detector had given a .2mG reading so far. Investigators moved to the kitchen area. Bailey got a .3 and a .4mG EMF spike at the end of the bar area and then it was gone. Nothing strange or unusual was found in any of the audio or video of this moment. Cabinet doors are very sturdy, lock shut, and take some effort to open and close them. recorder. Investigators are in the kitchen area at this moment. 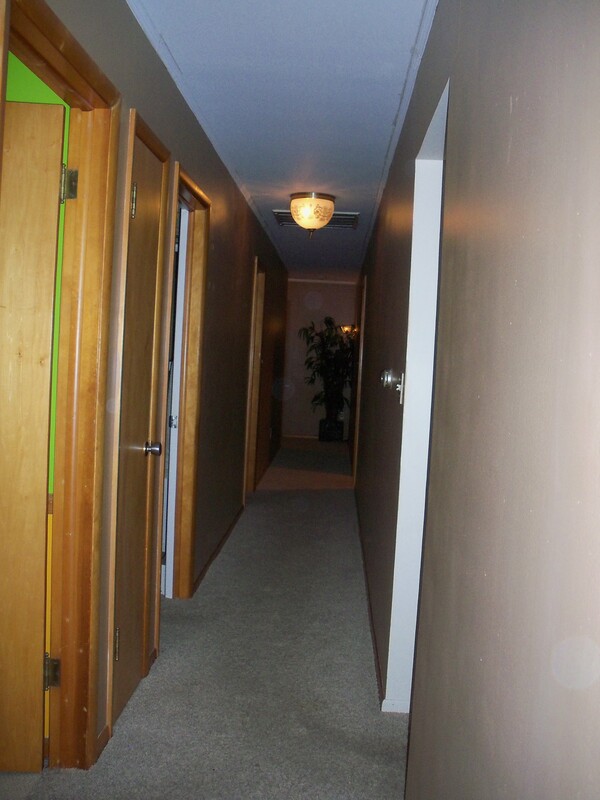 Investigators did not notice any light play or reflections on the walls, but they did notice it out in the hallway. There were no unusual EMF or temperature readings. There were no responses through knocking requests, the K-II, or Trifield Meter. Bailey and I sat in the hallway while Norman and Cassie investigated the master bedroom. There were no unusual experiences or readings in the hallway. We stayed pretty quiet and tried not to interrupt Norman and Cassie. 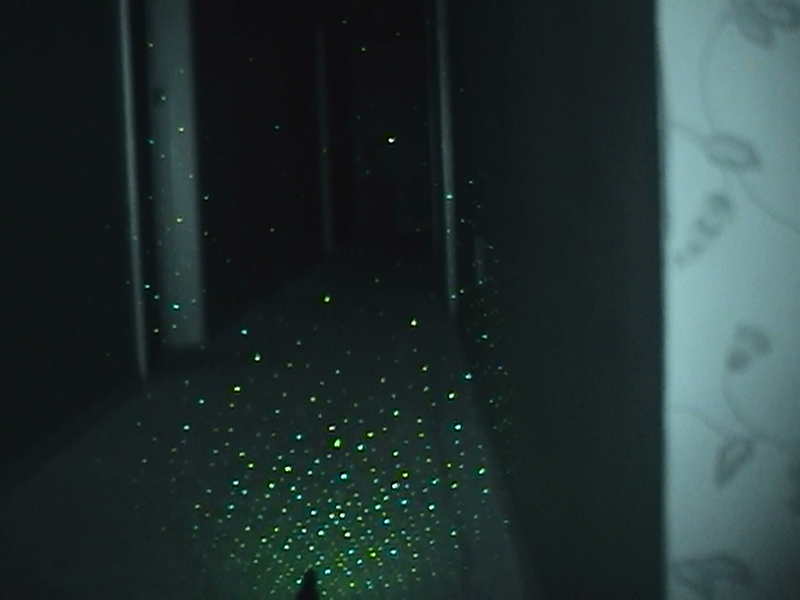 We aimed the laser grid down the hallway and kept our eyes peeled. 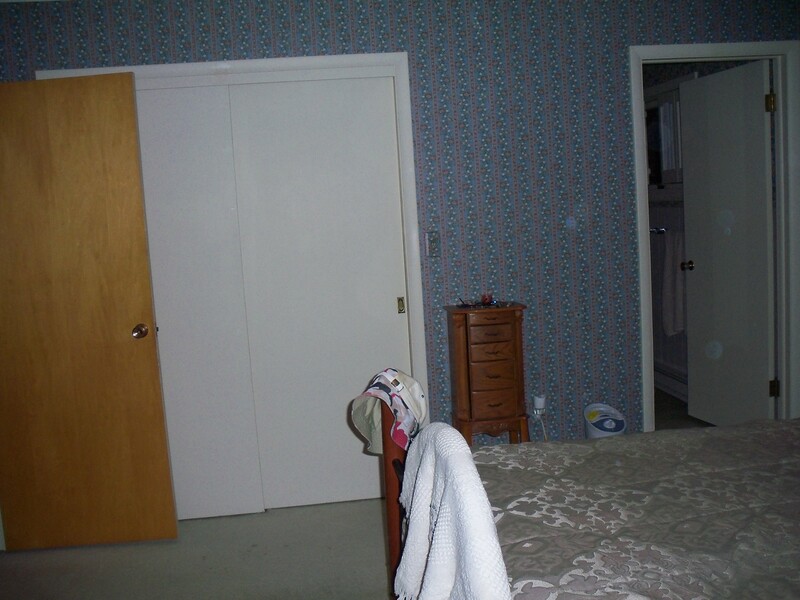 The dining room camcorder, placed on the china cabinet for the entire investigation picked up a loud pop close to the camera (investigators were on the other side of the wall in the hallway and in the master bedroom). Cassie mentioned getting chills right after walking into the master bedroom. Investigators (as well as Bailey and I later) noticed the clicking sound coming from something on the dresser closest to the bedroom door when someone walked near. At one point Cassie heard what she said may have sounded like shoes rubbing together or a kind of squeak. Norman claimed he wasn’t moving. The sound is not picked up in either of the audio recorders or the camcorder video. The temperature was higher in the closet as compared to the rest of the room. It went from a 71.9 ̊F in the room to 73.1 ̊F inside the closet. At approximately 10:22pm Cassie thought she may have heard a knocking (2 knocks) coming from inside the closet while Norman was in the master bathroom. It can be heard in the audio. Norman and Cassie were waiting to see what shadows would be cast on the wall as a car was driving by. When Cassie says “I hear one” she means the car coming down the street. 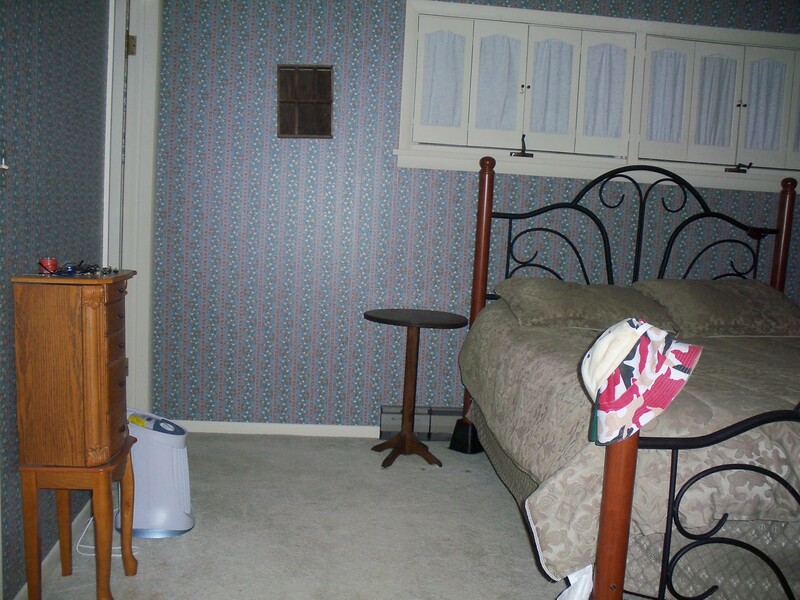 the small dresser right next to the closet for the entire investigation. Norman noticed that when a car drives by from a certain direction, the reflection from the square mirror in the master bathroom bounces from the bedroom underneath the windows to the bathroom. Just a few minutes after the previous knocks you can hear 2 thumps that Cassie heard coming from the closet. They mentioned that it almost sounded like it was coming from the floor in the closet. They both tried to recreate the sound by shifting their weight on the floor, etc. They couldn’t do it. They then noticed the room had warmed up to a 72.6 ̊F. The last reading was a 71.9 ̊F. Video Evidence: 10-22-11-6CAM – Video footage from Cassie’s camcorder. Bailey and I moved into the master bedroom at 10:32pm while Norman & Cassie investigated the other two bedrooms. I noted that on my last visit I thought I may have felt a “cold spot” in front of the closet and asked if someone could make that happen again. The temperature at the time of the request was 72.3 ̊F. I asked if the entity could make it lower. 72.1, 72.0… then I opened the closet… a few minutes later… 72.3, 72.1, 72.0, 71.9, 71.8, 71.6 (and then back up). The EMF was a 0mG the entire time. This was all over a period of about 5 minutes. You can also hear a series of thumps that seem to come from the closet area (although neither of us mentions them in the audio so I’m not sure if they were caused by investigators or not) while I was standing at the closet taking the temperature readings. knocks are not heard in the video. Later I moved to the dresser on the opposite side of the closet and the temperature was approximately 72.9 ̊F. On the bed were readings that went up and down, but the highest was 73.6 ̊F. The hallway outside the master bedroom was 72.3 ̊F . The homeowner walked through the house with Norman & I and we were later joined by Bailey & Cassie. The homeowner explained feelings he was getting as he entered the master bedroom. He also kept an eye on the Mel Meter. Going down to the basement the homeowner was feeling it all the way from his knees to his shoulders. No unusual readings on the Mel Meter. The homeowner was also getting feelings near the bar (During pre-investigation readings Bailey & Cassie made note of a 3 degree temperature drop, and later on in the evening an EMF spike is noticed in the same spot). The homeowner told us some stories and tried to establish communication in many of the rooms throughout the house. When I listen to this audio I hear what sounds like a cabinet door opening. Something near the camera for sure. Nothing can be seen. The homeowner requested to dim the chandelier more so this evidence is basically just audio. To my knowledge all investigators are coming up the steps from the basement and making their way into the master bedroom again. You can hear them very softly in the background. Audio Evidence: 10-22-11-9AUD – A thud that seems close to the recorder. Investigators are all in command central. After sitting in one of the chairs with the camcorder, I made note of a 0mG EMF reading and a temperature of 72.5 ̊F. Not long after I asked any entities present to “please touch one of us”, I noted an EMF reading of .2mG and a temp of 74 ̊F … then 73.8 ̊F and a 0mG. A minute later temperature reading was 73.5 ̊F. I have no explanation for the inconsistency of the readings. At one point Norman asked “What year is it?”… you can hear me adjusting something on the illuminator or the camera and then you hear an interesting response. I’m not sure if it is noise from my messing with the camera or clothes rubbing against the chair. Norman later heard some kind of thump coming from above while sitting on the couch. It is not audible in the video. No investigators were directly above, but I radioed Command Central to ask if they made any noise. They claimed they were being very quiet. I made note of a .2mG spike followed by a .1mG at the end of the bar. This is about the same location where Bailey and Cassie made note of a 3 degree temperature drop during pre-investigation readings. Their base EMF reading was 0 – .2mG. Also, earlier in the evening the homeowner had experienced feelings at that spot. I found this audio of a whistle followed by a strange clicking noise. It was from off in the distance, and I knew that Norman and I were investigating the basement at the time. 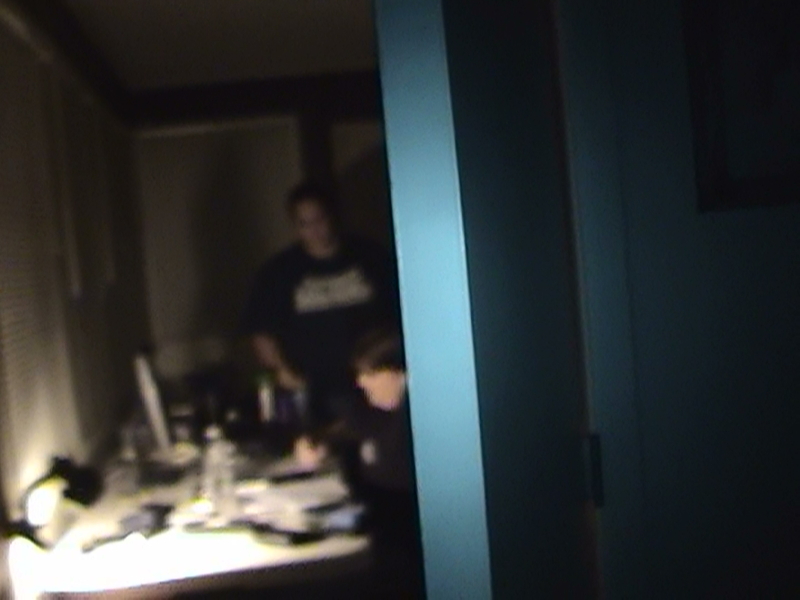 I matched it up with the camcorder video from the basement investigation and found that it was the basement bathroom door opening. I had just walked in to film a bit of the bathroom. It is an interesting sound that confused me for a while. Could this be something the homeowner hears? with Norman and I downstairs… bathroom door opening. You can hear a squeak off in the distance. Sounds like it could be a door. DVR footage shows that Norman and I are in the laundry room at this time and none of the other investigators left command central. It is unclear what the squeaking noise could be from. At 12:29am Norman and I investigated the laundry room. The power box in the laundry room had a reading of anywhere from 20 to 31.9mG. The upstairs hallway is right above the power box but we never noted any spikes there. The pressure reading was 29.32 in. Leaving the laundry room while Norman was checking out the bathroom, I heard a tap and a squeak from what seemed to be the basement entrance. Could it have been Norman moving the bathroom door? We inspected and opened the basement door to find no one. We couldn’t get the door knob to make the same squeak. While we were checking out the door, I noticed that all of a sudden the computer screen was on and you could see the desktop of the computer with “Norton security alert”. Did Norman set something on the desk causing the computer to wake up? Was it routine virus scanning scheduled for late at night? Could the tap and squeak have come from the computer waking up rather than the basement entrance? laundry room. Also, footage of the computer screen popping on. I now believe that the squeak that I thought came from the basement entrance actually came from Norman opening the bathroom door. It is the same squeak that is documented above in 10AUD and 11CAM. I'm not entirely sure about the click though. At 12:42am Norman & I went outside to grab some things out of the car. When we returned at 12:45am the computer screen was dark again. 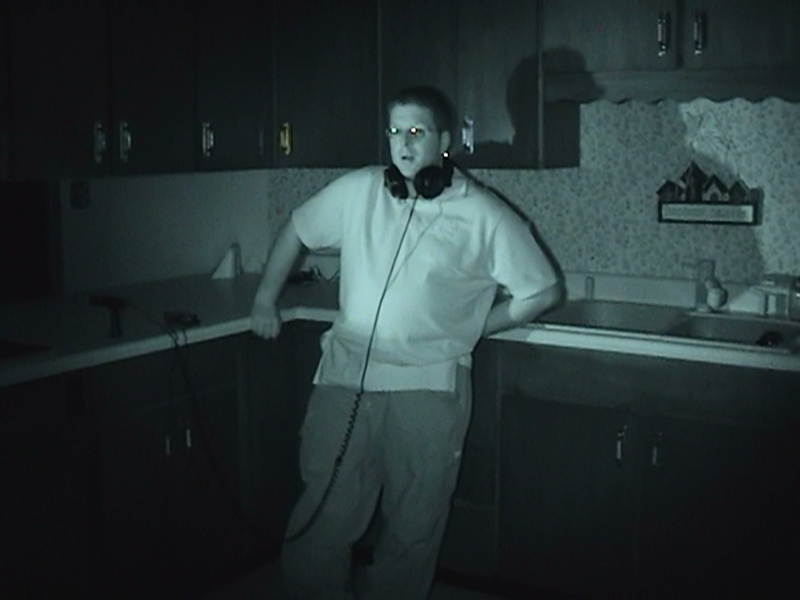 At 1:08am in the green bedroom, Norman claims he heard something that sounded like a cat whining. He asked if it was the sound of the camcorder but they decided it was not. It is not audible in the video and we do not have audio of that moment. At the same time Norman is describing the whining noise he’s hearing while next door in the green bedroom, you hear a tap coming from near the recorder in the master bedroom. At 1:20am investigators are in the Upstairs East Living Room. Norman made a request for any entities that were present to make the lights on the K-II meter flash. There seems to be a strange sound right after Norman says “we’ll sit down here and watch”. We do not have audio from that moment. Norman and Patrick relaxed in the master bedroom for about an hour. For much of that time both of us slept off and on snoring pretty heavily. At 2:59am Cassie radioed us from command central and woke us up. She said that 5 or 6 minutes earlier she heard noises or “thud like a door shutting and it sounded like it came from downstairs”… and “just now I heard like a screech weird sound outside the command central door”. Obviously we did not hear it. It does not seem to be picked up on our audio, most likely due to the snoring. What are the chances of Cassie hearing the snoring all the way from the master bedroom? Norman noted that he hadn’t noticed it getting hot or cold the entire time we were hanging out in the bedroom… it seemed to stay the same. For this visit we didn’t have the Mel Meter with us to know for sure. I had the Trifield and it never went off. I noted that the pressure still read 29.3 in. and that is pretty much what it had been all evening every time it had been checked. Could the following audio be an investigator’s stomach perhaps? Audio Evidence: 10-22-11-12AUD – From the Sony PX-720 next to the closet. At 3:25am Norman and I both heard a thud or a “bong” from what sounded like outside from the audio… but Norman mentioned it sounded like it came from inside toward the direction of command central. It is picked up in the audio. Cassie reported that they were starting to pack a few things up but they didn’t believe they made any noises to be considered a thud or bong. Later I mentioned it almost sounded like a car door. Audio Evidence: 10-22-11-13AUD – From the Sony PX-720 next to the closet.